With the smoke making it awful to be outside, I thought why not explore underground instead? 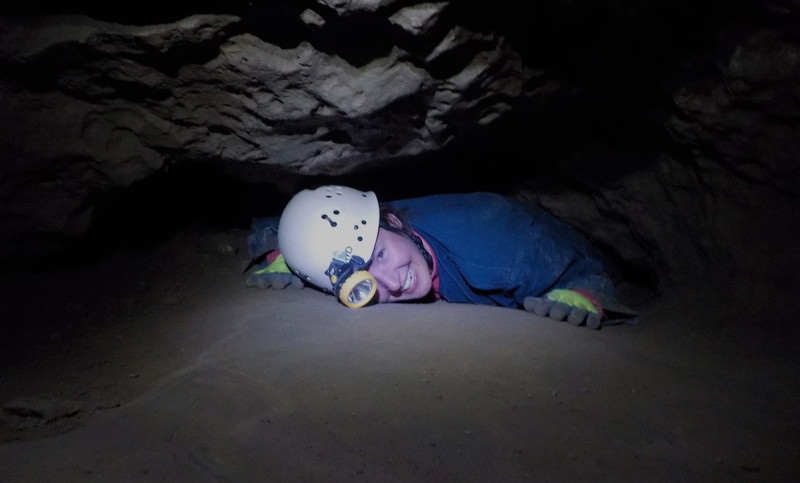 After making some calls and securing a caving guide, Suz and I ended up exploring underneath Grotto Mt just five minutes out of town. The Rockies, being made of limestone, are riddled with caves as the water itself dissolves the rock. As water penetrates weak layers, it pools and dissolves forming an intricate honeycomb network of caves. Since these caves require technical skills to navigate, they are not open to tourists. 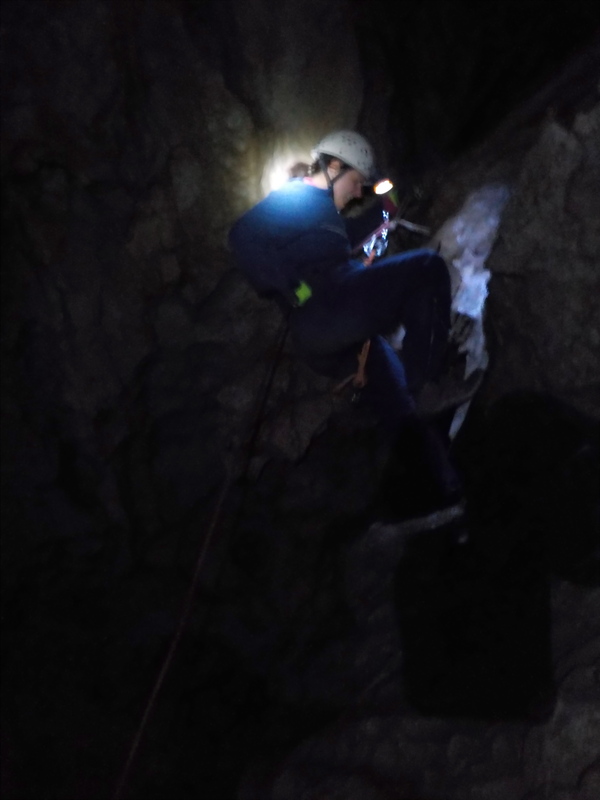 Given the contortions and rope skills required to navigate them, any mishap, even a twisted ankle can mean a multi-day rescue. For this reason, the Rat’s Nest Cave by our place is locked up with a metal gate over the entrance. 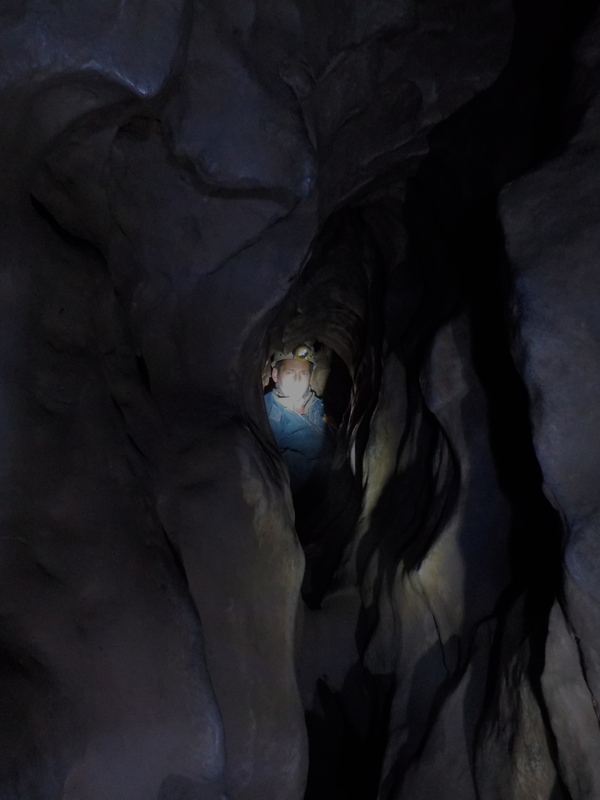 This cave is completely raw in that there is no lighting, no walkways or railings, no man made features. It’s in the state it was found in. Being able to experience the thrill of exploring something in its original condition is something I’m very grateful for. 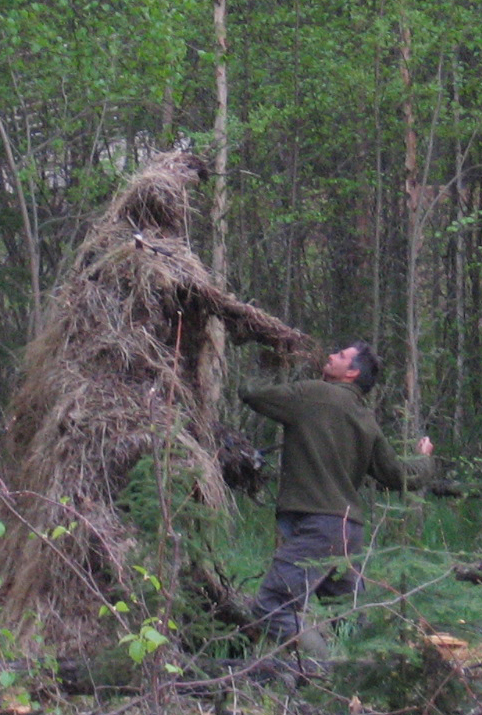 It gets its name from the pack rats that build nests just inside. We didn’t see any though I’m told they are kind of fuzzy and cute. After doning our safety gear at the entrance we left everything else outside as the passages are just too tight to bring anything like a pack. Even my good camera was left at home, exchanged for a slim, digital automatic. As there is no place to go to the bathroom, we leave the water outside and do our best to empty our bladders. Climbing harness, knee pads, helmet, headlamp, gloves and protective jumpsuit is all we were allowed. Above: At the cave entrance looking very clean. Upon entering the cave, we tie our harnesses into a safety bolt. Good thing too as my eyes slowly adjust to the half dark cave entrance, I see a black abyss in front of me. Chris tells us it’s a 50 foot drop with nothing but a pile a bones many feet thick. 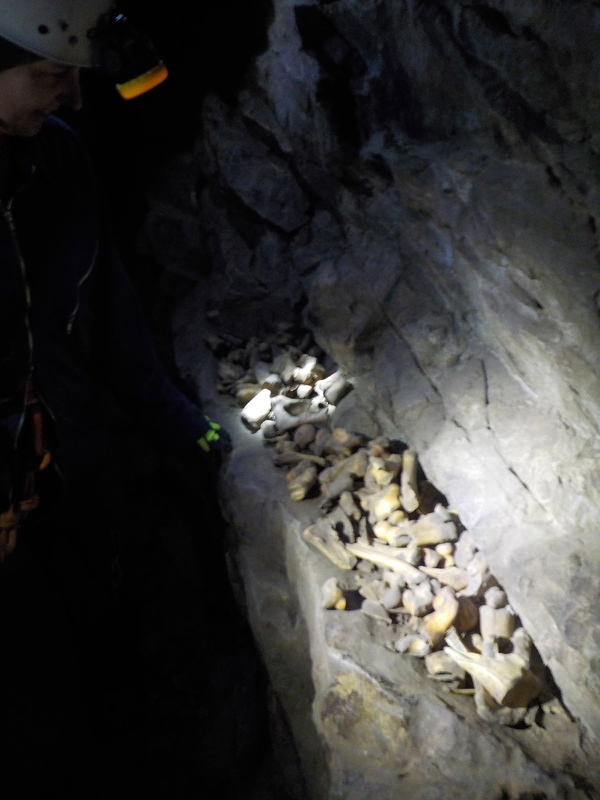 The bones of over 30 different mammals have been discovered at the bottom. I immediately feel a sense of dread. I later learned that the entrance is a place where stress is keenly felt mostly because you still have a frame of reference from the outside light leaking in. Compared to looking outside, the inside seems really scary. As we left the light behind and pressed forward, I calmed down. The interior is a tangled mess of jagged rock carved into scallops by periods of heavy water flow from the end of the last ice age a few thousand years ago. There is no real up or down. Cracks, fissures, ridges and holes go off in every direction and angle. In the light of the headlamp, the rock colour is a brown-grey wash. Cold and clammy and slippery in places, the polished limestone is sharp and split in places and elsewhere rounded and bulbous where the calcite is forming from slow dripping water. 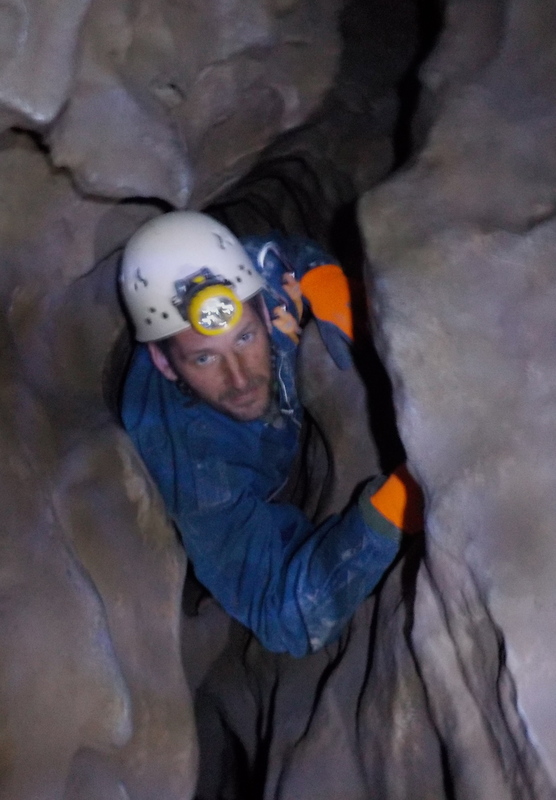 Chris leads us as we slither through a cleft on a 25 degree angle with a roof about two feet from the floor. We emerge at an opening and the headlamps show a jumbled mess of bones. The pack rats drag bones out of the bone well at the entrance and chew on them for their calcium. The calcium makes their urine pungent and sticky. This stickier urine helps glue their nests together at the entrance to the cave. The smell also helps them figure their location. The smell is very strong and I found it similar to Heineken beer. Above: Looking at the bones the rats have pulled out of the well. Suz found an interesting martin skull among the bones. Some bones show signs of human influence indicating that some native people discarded bones down the hole at the entrance. We made our way through the interior mostly crawling but occasionally with some headroom to stand up in a hunch. Often it felt like climbing but horizontally. Upon reaching what seemed like another dead end, we could see that the passage turned straight down. A bolt station was drilled into the rock and we rappelled down a 60 foot shaft. I found this easier and harder than a rap down a cliff face. In a way it’s easier on my mind because I can’t see so its not as visually scary as leaning over a cliff and seeing how far the bottom is. On the other hand, you cant see the passage turning and twisting causing you to get thrown into the walls a bit. I was glad to reach the bottom and as I went first, I was now very isolated as I couldn’t hear the others. I was only 60 feet away from them but it was a very scary sensation to be now by myself in the bottom of this shaft. I turned off my light for the complete experience. After the rappel, we had to go through a squeeze called the “warm up squeeze.” The temperature in the cave is a chilly 4 degrees year round. It’s basically the annual average temperature of Canmore as the cave has been reaching equilibrium with the outside for thousands of years. The Warm Up squeeze is so named for the energy you spend getting through. Its about the height of the helmet so the only way to get through is to “superman” yourself, then push with your toes! The bottom is coated in slippery calcite and offers nothing to grab onto so unable to bend your arms or legs, you use your feet like flippers to push through. If it sounds awful it’s because it is. But in it’s defence, the sensation of having a whole mountain literally on your back is truly unique. Above: Suz emerges with a smile through the Warm Up Squeeze. She never seems to get stressed out and is the perfect person to have along on dodgy adventures. This connecting tube is only a couple body lengths but the feeling of the roof pushing against my back got my heart racing. The darkness also makes tasks psychologically difficult though this would be hard in the light. After some more scrambling, we entered the “Laundry Chute.” A vertical hole just big enough for a person, that does a 90 degree bend into a smooth downward chute for 20 feet or so. Above: I’m descending into the “Laundry Chute.” Once my feet touch the bottom, I have to fold in half and lay down feet first, face up in a position too similar to a coffin for my liking. Then with the roof and sides just inches from your face and shoulders, you slide slowly 20 feet through the downward sloping shaft to the bottom. Thankfully we don’t have to return this way. Gravity does not line up with the passage though and the exit from the chute involves some awkward moves. Above: Suz looks straight down at me in position in the “Laundry Chute.” I’m on my back about to start the long slide down to the next opening. When I’m in the mountains, I always have an internal monitor running of how far or how long it would would take me to get back to the road. At this point in our caving trip, the feeling of being far away was very intense. Far more than being 10 hours up a mountain. This section felt like going through some complex plumbing. 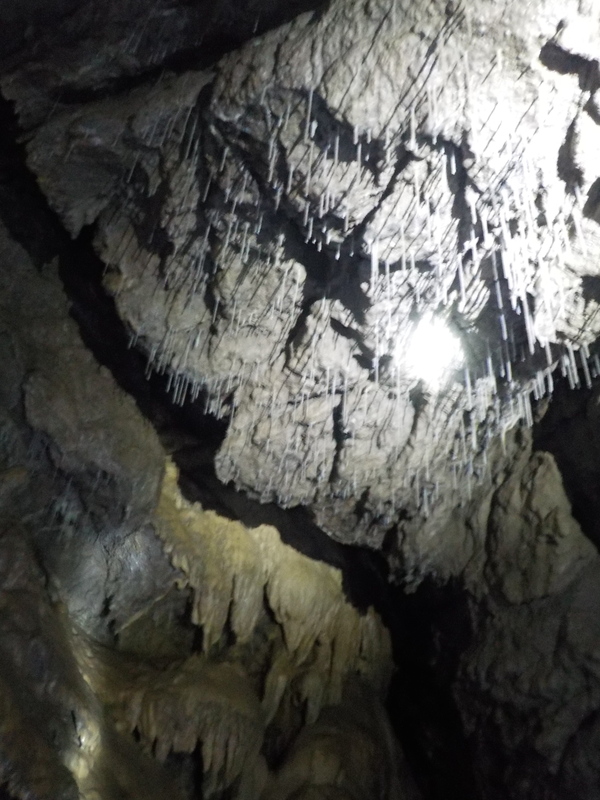 The contorsions were worth it as we emerged in a grand cavern perhaps 200 feet long and 50 feet high complete with the familiar looking stalagmites and pillars. Above: This Temple of Doom style roof contained some elegant “drinking straw” stalactites several feet long. An amazing sight was the phosphorescence of some of the formations. A perfect pearl-like sphere of calcite the size of a mandarin orange was exposed to a camera flash. With our headlamps off, it remained glowing green for several seconds in a ghostly ethereal demonstration. Staring into a glowing green orb hundreds of feet underground is pretty weird. Above: At the furthest depth was this Gollum-esque pool with the haunting sound of a periodic drip. 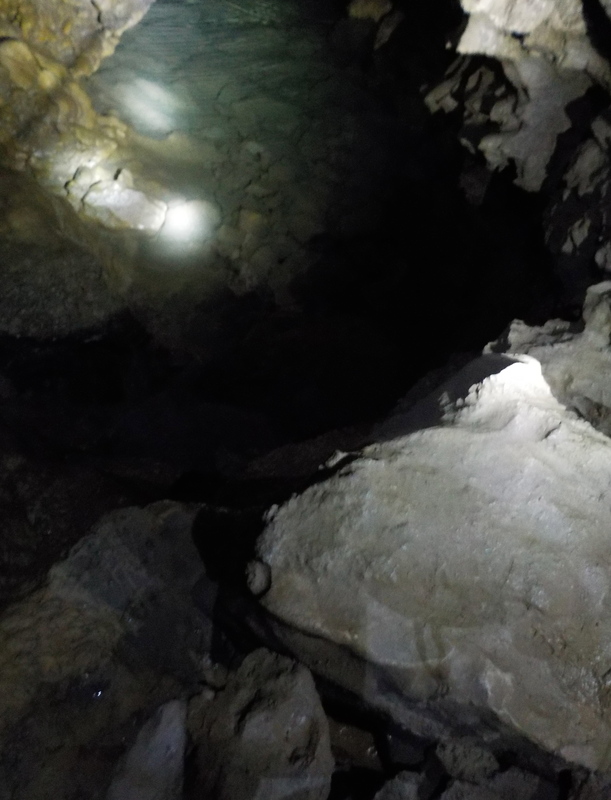 The cave continued through the water but scuba-caving involves a pretty high level of risk management. Our guide Chris said he prefers to “chose life.” I found this pool with its green glow a very haunting place. So much of it is familiar yet in such an incredible place. A dream-like quality with hints of the familiar and fantastic. I thought the journey out would be hard but downclimbing is always harder than climbing, so the way up and out was more straightforward. After emerging, we hiked off the mountain as Chris explained some geology and caving stories. He showed us a full map of the cave system. 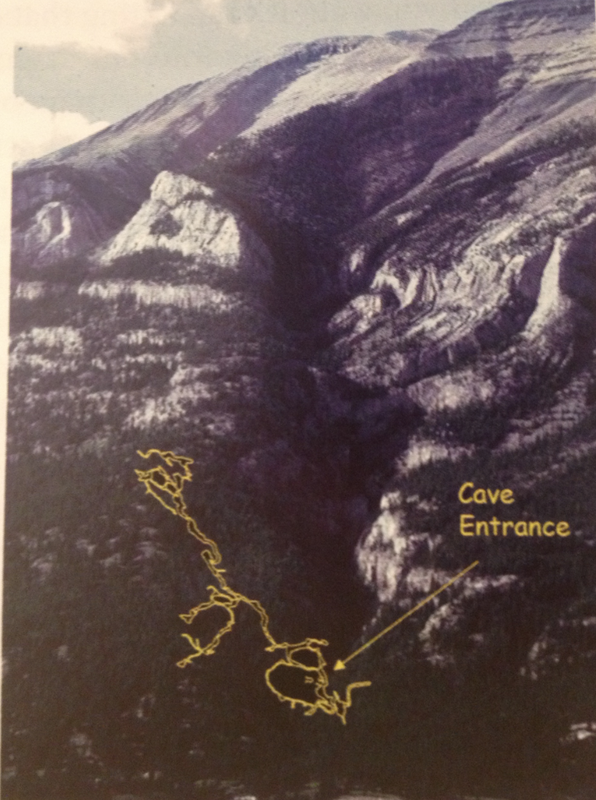 We only explored the bottom ring as seen on this map superimposed on Grotto Mt. Now I have been on the summit of this mountain , and at its very roots. A singular experience!! 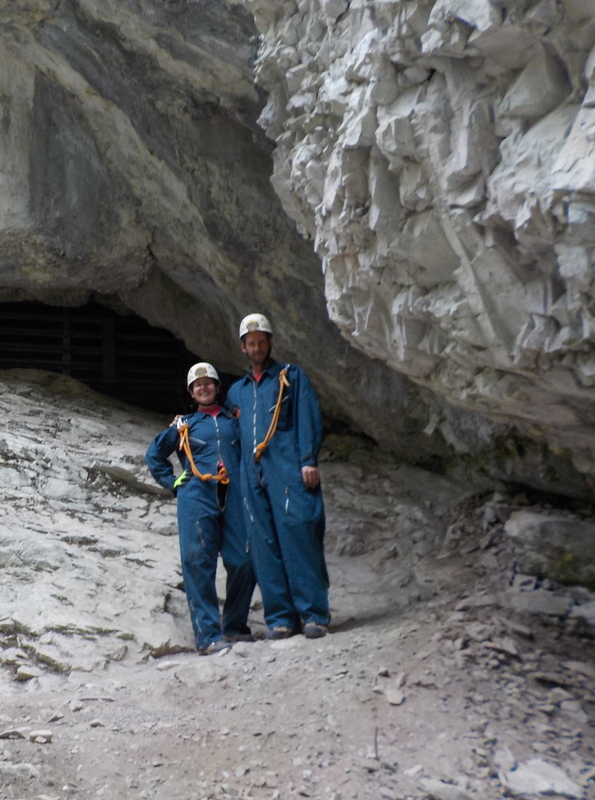 I’m not sure if we will ever go caving again but this adventure will be imprinted on my mind for ever. Incredible journey, Doctor. Great pics. You mentioned that the cave was locked/gated. What did you have to do to gain access?